When God promised Abram that He would become Abraham, meaning "the Father of many nations", he took God at His Word, and believed Him. In fact, the Bible reveals that Abram was "fully persuaded," even though both he and his wife were physically too old to have children. Naturally speaking, becoming a father of multitudes was an impossibility. But with God, nothing is impossible, His Word carries His life in it, and when we embrace and believe it, the power of the Holy Spirit goes to work and causes it to produce exactly what it says in our lives. It did it for Abraham and Sarah, it will do it for us too. 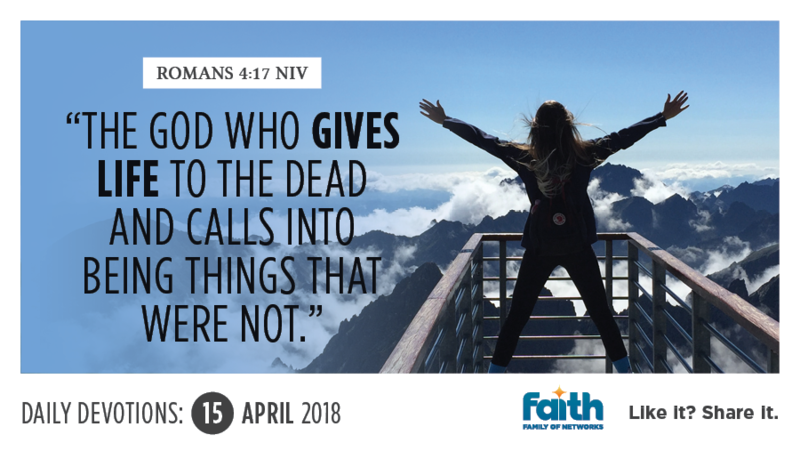 God's Word has the power to bring what is dead, to life and it "calls into being things that are not." Literally translated from the Greek, this verse would read: "calling the things not being as being". The Greek word for "call" means to summon or an order to appear. It speaks of a legal order for a person to appear in court on a specific day, at a specific time and place. When God's Word goes out, it's not a request; it's a command, one that everything, regardless of whether it exists or not, pays attention to. God used His Word to speak the universe into existence, He "commanded the light to shine out of darkness..." (2 Corinthians 4:6 KJV). The Bible states that because of the finished work of the cross, we have been given the authority to use His Word to decree and speak His will concerning us, into existence. So stand in the authority you have been given, as a child of God, speak His faith filled Word, and watch it go to work.